Request Your FREE Snapshot Report Today! People are reviewing your business - are you paying attention? A Detailed Analysis of Your Business Will Be Sent Straight To Your Inbox. Do you own a small or large business? If yes, click the button below to request your freesnapshot report! Yes, I Want a Snapshot Report! As soon as you click the button, you'll be taken over to this powerful 100% FREE tool! Wait A Minute... What Is A Snapshot Report? Glad you asked :) A Snapshot Report is a scorecard of your "virtual doorway". Nearly 75% of people lose trust in brands with inaccurate business listings (that means wrong phone number, missing address, no link to your website, etc.) There are hundreds of sites you need to be listed on so make sure you’re not losing real money because of bad listings! Most business don't have enough reviews, and often the ones they dohave aren't saying good things! Nearly 95% of potential customers make decisions based off a business' reviews! Snapshot Report will grade your reviews overall, and tell you if there's a need for some damage control. There are a lot of potential customers out there hanging out on social media. Your Snapshot Report will tell you what you can improve to gather up more customers from your social media profiles. Having an optimized website that allows people to locate you and contact you is crucial. See how your website ranks against your competitors, and what items can be improved. A Detailed Analysis of Your Business, Sent Straight To Your Inbox. Every day, customers are reviewing/mentioning/ and sharing experiences about places they visit, whether they're on Yelp, Urbanspoon, Tripadvisor, Google+, Facebook, personal blogs, or elsewhere. And since 85% of consumers find local business info online, you need to know what your customers are saying about you. 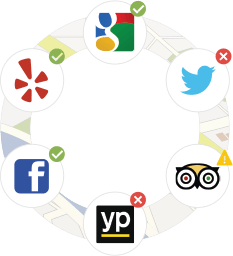 Never again lose a customer because of a poor review, incorrect listing or a weak social media presence. With a personalized snapshot of your "virtual doorway", you'll have the ultimate competitive advantage in your local marketplace. Ready To Take Your Business To A New Level? Sign In To Receive Your Free Snapshot Report Today!